168005 approaches Tackley in superb late evening light on Sunday 20 June 2010 with the 1G58 19:58 Oxford to Birmingham Snow Hill Chiltern Railways service. 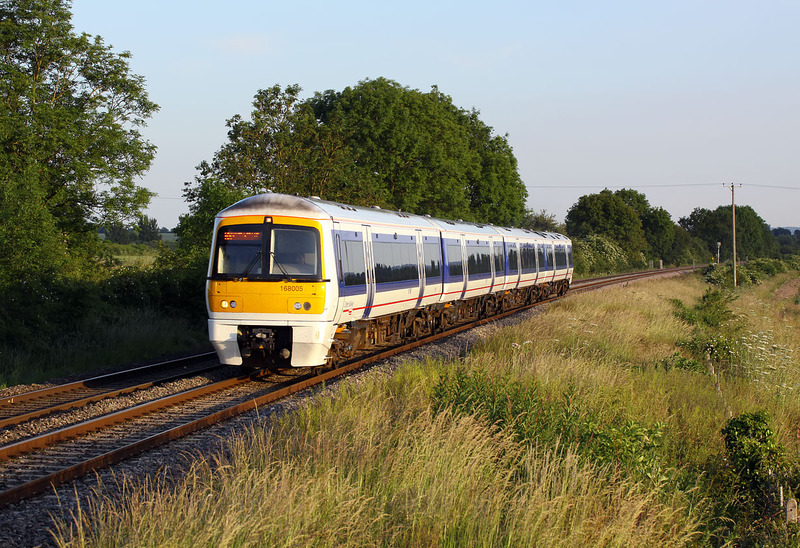 The Chiltern Line was closed for engineering work, with trains being diverted to Oxford, from where passengers could travel onwards to London via First Great Western trains. Although a virtually completely sunny day (at least in the afternoon), typically just before this train was due a small cloud decided to find the sun. As there was little wind, it wasn't moving very quickly, and I thought the shot would be lost. However, just as the train came into view in the distance the sun gradually dropped out of the cloud. Talk about a close run thing!